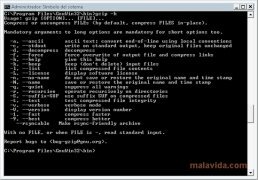 Gzip, or in other worlds GNU ZIP, is one of the most famous compressors developed for Linux. And due to its success on that platform, it has now been ported to Windows. One of the greatest advantages of gzip is that it uses the DEFLATE algorithm (a combination of LZ77 and Huffman coding), thus, it doesn't use a compressor algorithm that is subject to a patent. As well as for that reason, the use of DEFLATE comes in very handy, because it guarantees that the compression/decompression will be lossless. The great drawback of gzip is that it can only be used from the command line console, and due to this fact, those people that are only used to using programs with a graphical interface may find it somewhat difficult to use. Nevertheless, those people that have used the program under Linux shouldn't have any problem at all when it comes to using it. 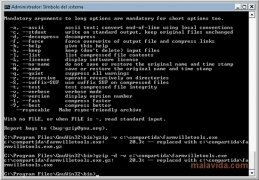 Therefore, if you're looking for a good free compressor, and you don't have any inconvenient in resorting to the use of the command line console, download gzip now.